Atlantic City is a master of reinvention. The glamour and glory of the Prohibition era may be long gone, the ‘Boardwalk Empire’ immortalised on our TV screens have crumbled, but the city moves on. AC’s prime position means the beaches, shops, restaurants and casinos still draw people from far-and-wide. Discover it all with this insider’s guide. That salty tang in the air? That’s the sea – something you don’t get in Vegas. Stroll down Atlantic City’s boardwalk and although the vast neon signs and vintage hotels might have gone the way of the dodo, you’ll still enjoy that fresh sea air. The golden sand beaches here are quiet even in the height of summer. Why? Well, a lot of people are glued to the slot machines in the numerous casinos, and others just don’t know what they’re missing – this stretch of Jersey Shore is a winner. Brave the waves and go surfing, parasailing or kayaking, although you might want to swerve Gunnison Beach, where every other person is naked. Head down the coast to Asbury Park and wander the abandoned casino for a reminder of the past and of how empires rise and fall. You won’t find any cutting-edge rides here but you’ll still fall in love with the Steel Pier amusement park. Like Coney Island, it makes a virtue of its retro charms. Grab a slice of pizza and queue up for the slingshot or range of family-friendly rides. Here, jutting out into the Atlantic, you can feel the spray on your face as you wait to hop on a helicopter that will take you for a city ride. 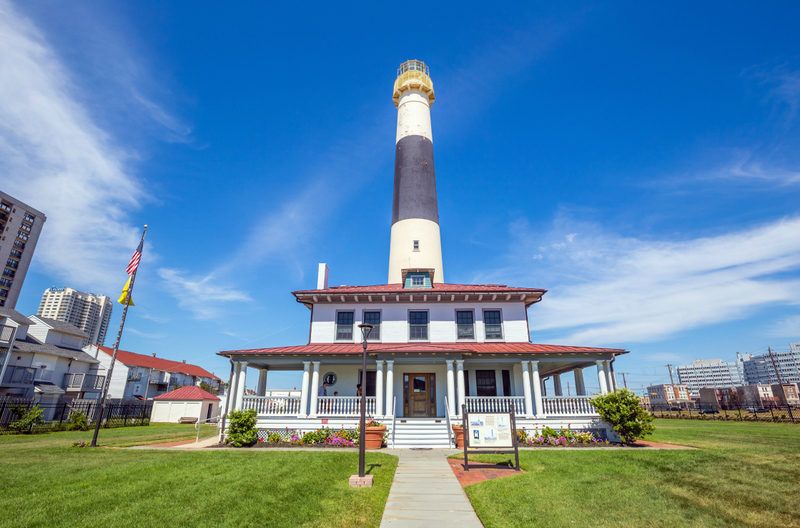 For another bird’s eye view, climb the 228 steps of the Absecon lighthouse. Hit the top on a summer or autumn evening for a moonlight spectacle that will reveal the best side of AC’s gleefully garish glory. All shopping streets should have the sea on one side, right? Atlantic City’s legendary boardwalk was built in 1870 and has seen history and legends come and go. 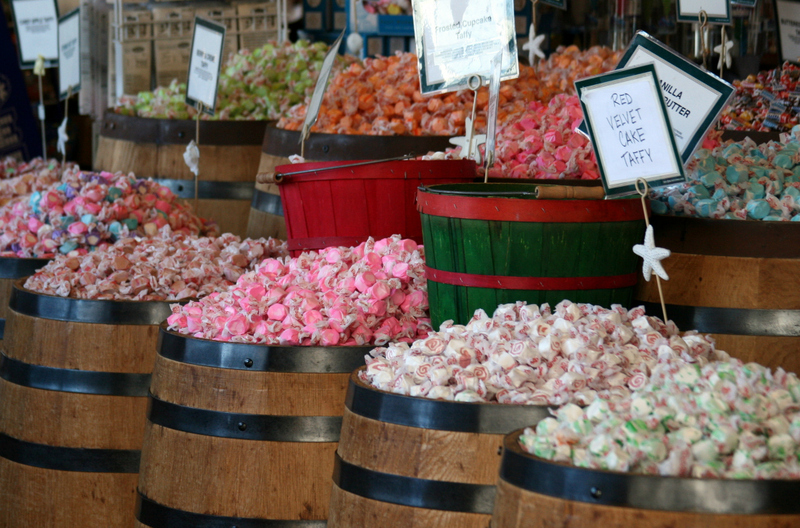 As the waves break on one side, browse some of our favourite shops, including the numerous saltwater taffy outlets. There are a few different versions of the story of how this chewy sweet was invented – most involving an assistant who swapped the usual fresh water for sea water and hit upon the recipe. Joseph Fralinger was the first to sell it in Atlantic City and you can still buy taffy from Fralinger’s on the boardwalk. Less historic but perfect for one-stop shopping is the Playground Mall, sitting right on the boardwalk. It’s high-end – think Tiffany, Louis Vuitton and Michael Kors – but an ideal spot for indulging in some serious retail therapy. Stroll the pier or the boardwalk and it’s hard to resist the smell and sizzle of the seaside treats. Pizza, hot dogs, fudge, funnel cakes, ice cream – it’s all here. If you’re not worried about your waistline, grab a fistful of fried Twinkies, or pick up some chocolate covered bacon at Steel’s Fudge shop. Sugar rush over, take a walk along the ocean front before dining at a couple of the city’s grandest institutions. Dock’s Oyster House has been shucking bivalves since 1897, when Harry ‘Dock’ Dougherty first opened its doors. They still do the basics brilliantly – oysters, lobster, crab cakes, sirloin steak – but have moved with the times with lip-smacking ceviche now on the menu. The same family now owns the legendary Knife and Fork Inn. Opened as an exclusive club by the city’s mayor and commodore in 1912, this was where the real-life Enoch ‘Nucky’ Johnson used to dine. The Doughertys have renovated the restaurant and restored some of its 1920s splendour, and it’s now a fine place for some high-end eating. Push the boat out with the lobster tail and filet mignon combo, or go for the seafood sampler from the raw bar. It’s popular, sure, but you’re dining in a part of Atlantic City history. From gambling to gaming, surfing to salt-water taffy, snacking, shopping and sun-seeking, Atlantic City is a wonderful place to explore. Car hire in Atlantic City is the best way to see the casinos and history, and bask on the nearby beaches.